We had quite a storm on Sunday. Our buckets indicate 6+ inches. 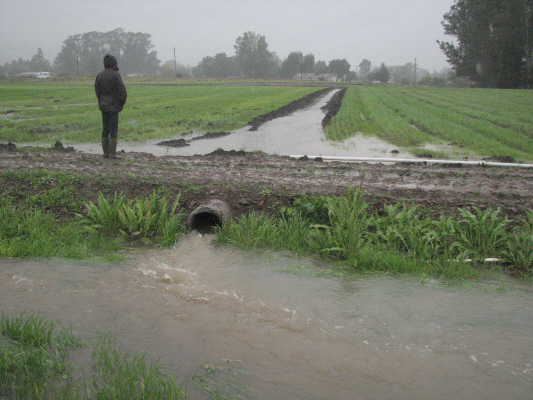 Before we left for Christmas festivities and a 2 hour drive south through the downpour, we drove around the farm to get an idea of how the new drainage was working. And what we would have available in the coming weeks. We were well prepared for this huge storm. The fields look darn good and there is plenty to harvest out there, thanks to recognizing how to make things better and having the equipment and carving out the time to make it happen. This entry was posted on Thursday, December 27th, 2012 at 11:37 am	and tagged with Crops, farming, rain, winter on the farm and posted in Uncategorized. You can follow any responses to this entry through the RSS 2.0 feed. It’s nick….my pigs would love to get some of those reject carrots or just about any other rejected vegetables! Drainage is lookin’ good too. Most impressive. cool photos. ps. you know where they are. I see that you are well ahead of me on the blogging thing. Very nice. I love the pictures and wish I could replicate the quality. How did you make your hoops and covers? I have been wanted to do some row covers, but could not figure out how to make the hoops on my own. Paul bought a pipe bender. Cut then bend electrical conduit. 6′ wide 1.5 mil plastic. Cover with shovelful of dirt on each side then use the clips onto the pipe to hold it tight. Wind is a factor. We changed the orientation of the fields (for many reasons) this year and the plastic is much better behaved! Thanks for the description. Did you attach anything from hoop to hoop other than the plastic? I tried to design my own, but failed at the point of keep them equidistant and stable. Can’t figure out how to put a photo in this reply. But yes, they tie the top of the hoops together with a tough poly string, simply wrapping around once then on to the next. I’ll send a photo. Hope it works. Might be even more useful in Ohio than here, though the hooped beds are really helping us this year.